What if you could do something to guarantee you would not fail? How much would that be worth to you? Knowing going into any project or setting any goal that you would succeed. How good would that feel? How would it change your attitude when you start out? Well there is such a power. 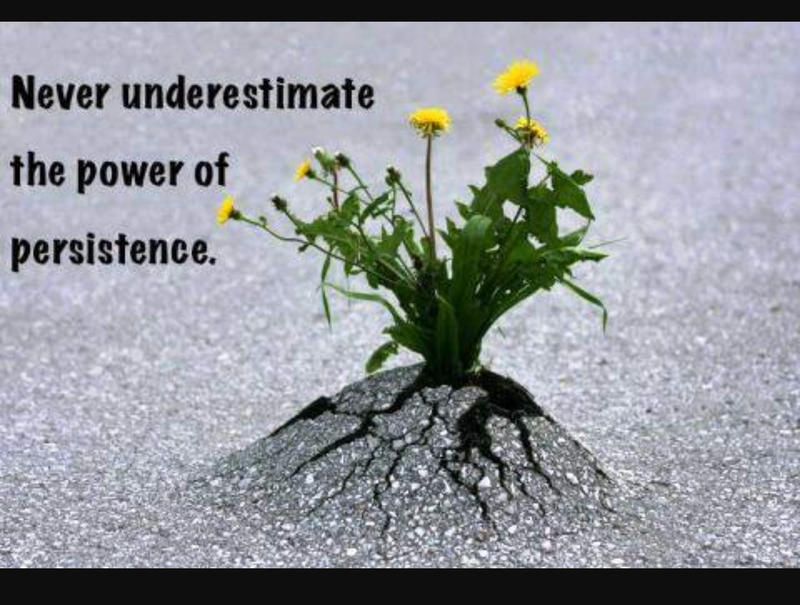 It is the power of persistence. It was Babe Ruth who said “It is hard to beat the man who never gives up”. He went on to set the record for home runs. There were days that he struck out, days he couldn’t seem to get a hit, but he just kept swinging. So if this power is a guarantee why doesn’t everybody achieve all of their goals? The reason is this, although persistence is a sure fire way to succeed it is not easy. After all who wants to keep going after they “fail” at something. Who wants to get up and try again? Still, Edison did it 10,000 times while trying to perfect the light bulb. Who would keep asking after you hear “No” again and again? Still, Walt Disney did it after being told “no” by over 300 bankers when trying to money for Disneyland. Can you imagine life without those two things? I am not Walt Disney or Edison you say. Obviously that is true as they have both passed away and you, my dear friend are alive and reading this. So how can we develop determination and persistence like those two? This is how, by using the P words we have learned so far. Discover your purpose. Then, list what you will lose by not achieving it and gain by doing so. In other words, give your self a dose of both pain and pleasure. Then increase your knowledge and why in the subject to fire up your passion. Then rest assured in the knowledge that if you persist you will not, in fact you cannot fail. In case you are still having your doubts on your own abilities to do so, here are two more real life examples. The first is a question I will ask you. How long would you give a baby to learn to walk? One day? One week? One month? How long did it take you? Did your parents tell you “Sit down and stop trying to walk, you are just getting in the way and are going to hurt yourself”? Of course not. So how did you learn to walk? You learned to walk but trying, failing and trying again. How long did it take you? That answer differs for each one of us. We rarely apply this thinking as adults. If we try and fail we become discouraged. We look around and compare ourselves to others. “Well they made a fortune by the time they were 30, I must be behind” or “they have found true love and I never will”. What if a baby looked at another baby and said, “Well they learned to walk in 2 days I guess I will crawl the rest of my life”? I dare say the majority of us would not be on two feet. So you have already proven to yourself you can persist. Here is one more example courtesy of the salesman. Have you ever had a salesman knock on your door when you were home? You ignore him but he keeps knocking. You look over at your spouse and say “can you believe this fool? He is still there?” More time goes by and more knocking. Finally you give in and yell “What do you want? !” A lot of us give up after one or two knocks. We here opportunity inside watching TV but we say to ourselves “Oh well opportunity must have slipped out the back door, I’ll just go home”. I am telling you, just keep knocking! Eventually life will give in and simply ask “What do you want? !” Remember the words of the Bronx Bomber, “It is hard to beat the man who won’t give up”. It is not only hard, it is impossible. You may fail several times, but you are only a failure if you give up. Please share this post and give faith and hope to those who may be tempted to give up. Feel free to leave your favorite example of persistence in the comments below. Previous Post THE MOST EXCITING P WORD!